The new version of ReaderWmf 5.5.4436 greatly improved reading metafiles from stream because it read the stream directly and did not create a temporary file from it as previous versions did. But unfortunately the code change had a bug that could produce NullReferenceException. This exception can also happen when using WmfViewbox or WmfDrawing. A new version 5.5.4445 that fixes that issue has been just published. Everybody that are using evaluation version will be happy to know that new evaluation versions of all the products now show the evaluation information dialog only once per day. Previous versions show evaluation information dialogs on each start of your application. If two or more controls were used (for example ReaderSvg and ZooomPanel) than each time you started your application two dialogs were shown. This was too annoying and is now lessened so the dialogs are shown only once per day. Another important change in evaluation version allows you to reinstall evaluation version (the same version or newer) after 90 days from the date of installing previous evaluation version. The 60-day evaluation time limit is still the same. But with previous versions you need to contact support to extend the evaluation version after 60 days. This was not very practical when you tried an older version before some time and at that time you did not need the library or it did not have all the features you wanted. But after some time you decided to try with the new version and you were not able to install the evaluation because it has already expired. Now this is not the case any more because after 90 days you can reinstall the evaluation version again. Note that when reinstalling the same version it is recommended to uninstall it before installing it again. There is still 30 days between evaluation expiration and possibility to reinstall after 90 days - this is left to prevent continuous use of only evaluation version. But if you need to extend the 60-day period you can still contact support to extend your evaluation. Of course there are also some other improvements and new features that apply for both evaluation and commercial version. Improved reading size of root svg object (improved support for viewBox and added support for preserveAspectRatio). The GetXaml method now preserves the width and height in specified units (cm or inch). Removed memory leak that occurred sometimes when reading embedded images. Improved reading embedded images - they are now read faster and with lower memory usage. Fixed problems when Path bounds were negative and IsSizeSetToPathElement in SilverlightXamlWriterSettings was set to true. Prevented adding PresentationOptions:Freeze="True" text to XAML for Silverlight. Added option to export for Silverlight 5. Fixed reading svg file that contain links to images and were read without specifying the whole path (Read method was called only with svg file name without the full path). Fixed leaking GDI+ handles under some circumstances. This could lead to "Cannot open wmf file!" exception after opening a few thousands metafiles. The Read and ReadGeometry methods that take stream as parameter now read the metafiles directly from the stream and do not create a temp file from stream as before. Improved reading textures in Model3ds and Viewport3ds. Added TexturesPath property to both controls - it can be used to specify custom textures path. If TexturesPath is not specified, the path of the 3ds file is used. Added support for cameras that are children of helper objects (for example when camera is linked to a helper object so the camera is transformed as the helper object). Fixed setting IsCameraAnimated property - Reader3ds sets this property to true if the 3ds file contains camera animations. Before the property could be set to true in cases when the camera was not animated. Added ReadLightRange property to Reader3ds. Before the Range of PointLights and SpotLights was not read. Now it is possible to read the Range with setting ReadLightRange to true. Note that attenuation data are not present in the 3ds file - if they are used they need to be manually set to lights after the 3ds file is read. It is also worth noting that with new version of Viewer3ds all the cameras defined in 3ds file are exported as comments in xaml. The xaml also get a description of the exported cameras. This makes switching between cameras defined in 3ds file very easy. Fixed rotating with MouseCameraController and CameaControlPanel when the scene in vertically inverted when Attitude is between 90 and 270 degrees. Fixed EventManager3D where under some circumstances a new object drag can be automatically stared just after end drag event. Improved MaterialTypeConverter: Added support for simply defining SpecularMaterial and EmissiveMaterials. For example the "s:32;Blue" text can be used to define MaterialGroup with DiffuseMaterial and SpecularMaterial (SpecularPower = 32; SpecularBrush = White; DiffuseMaterial = Blue). The "e:Yellow" can be used to show yellow emissive material. Also improved support for defining textures path (now files from local disk and from http can be used). Fixed occasional NullReferenceException in SphericalCamera when layout is updated in Visual Studio designer. The commercial version of ZoomPanel was not updated. I would like to conclude the blog post with something completley different - a new logo for the company AB4D d.o.o. I got the new logo from a design contest that run on 99designs.com. I was really satisfied with the contest and would really recommend that page to everyone. We are also making a redesign of the web page that will be available soon. We are also preparing a very interesting new product (but more on that later). I surely believe that the future is very bright for the company. I hope that our products will also make it brighter for you. 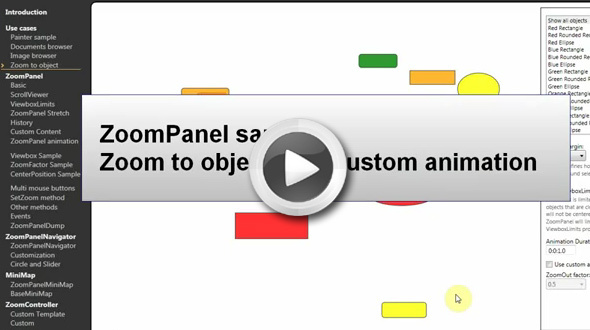 I am happy to announce that a new version of ZoomPanel is available. The new version greatly improves zooming animations with adding animation easing and support for custom animations. In the previous versions of ZoomPanel the zooming was animated with using a simple linear animation. Now a quintic function is used to ease the animation that starts slowly, than accelerates, decelerates and slowly stops at the new zoom level. The new version also fixes an issue with Viewbox with SetViewbox or SetZoom methods when the RotationAngle is not 0 and it is not changed. Before the RotationAngle was reset to 0 in some circumstances. I am really happy to announce that a new major release of Ab3d.Reader3ds and Ab3d.PowerToys libraries has been released. Added transparency sorting that prevents problems with transparent 3D objects in WPF. Improved reading of some 3ds files. Before describing some of the key features in more details let me first give you the full list of changes. Added support for simple transparency sorting that can prevent most of the problems with transparent objects. If the new IsTransparencySortingEnabled property is true (by default) the transparent objects are moved after non-transparent objects. For complex models with many transparent objects use of advanced transparency sorting in Ab3d.PowerToys is needed. Also added TransparentObjectsCount property to Reader3ds (so user can decide if he need to enable transparency sorting or not - with Ab3d.PowerToys). Added NameFormatString to BaseXamlWriterSettings - it can be used to customize how the object names are written to XAML (custom prefixes and suffixes can be added to names). Added possibility to read tga into BitmapImage with static Read method in a new Ab3d.Common.TgaReader class. Note: The previous versions of Reader3ds already supported reading tga files. But it was not possible to read tga files in your applications. This is now possible and enabled you to convert tga images to common files (for example png) that can be used with xaml created from 3ds file). This feature is available only in pro version. Fixed reading some of the objects with object matrix that has negative determinant. Fixed using ForceTwoSidedMaterials property for models that does not have material defined and where the default material is used. 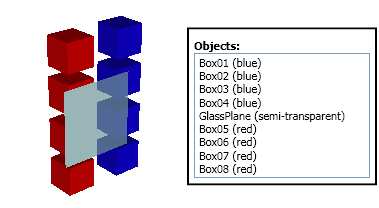 Fixed objects without material set (default material is used) and with object matrix that has negative determinant. Fixed when object with negative determinant is broken into sub objects for different materials - the parent's negative determinant was not used before. Fixed reading 3ds file where definition of two sided material is written outside material chunk. Fixed reading some partially broken 3ds file (objects with invalid triangle indices are not shaded). Skipped importing 3D objects that does not have triangle indices set (have only positions set). Fixed security exception in partially trusted WPF Browser applications - before the multi-treading code was not able to get the number of processors on the system. Added Ab3d.Licensing.PowerToys.EmbeddedLicenseAssembly property to speed-up looking for embedded license key in commercial version. Added support for transparency sorting with new TransparencySorter and TransparencyHelper classes. Simplified animating camera rotation with new StartRotation, StopRotation methods on SphericalCamera. There is also a new IsRotating properties. The MouseCameraController is also adjusted to suspend animated rotation while user rotates the camera with the mouse. Added axes names to CameraAxisPanel. Also added IsAxisNameShown, XAxisColor, YAxisColor and ZAxisColor properties to CameraAxisPanel. Added support for OrthographicCamera for all Ab3d.PowerToys Cameras. Added CameraType and CameraWidth properties to BaseCamera. Greatly improved creating wireframe from existing 3D models - now it is much faster and uses much less memory. Improved LinesUpdater - the lines that are removed from the visual tree are now free to be cleaned by garbage collection. Added Reset and UnregisterLine methods to LinesUpdater to manually remove lines from LinesUpdater. This enables better manual control of the registered lines. Improved measuring scene bounds in SceneCamera when transformations are used on Visual3D objects. Before the used transformations prevented the camera to correctly show the scene. Fixed selecting cameras with mouse click on camera icon in Visual Studio 2010 designer. Added GetCameraMatrixes to BaseCamera to get view and projection Matrix3D of the current camera. Improved Ab3d.Utilities.Dumper class - Added GetTransformText and GetMatrix3DText methods and made GetMaterialText public. Also the GetModelInfoString method now also displays the Transformation details. As seen from the new features lists above, both Ab3d.Reader3ds and Ab3d.PowerToys now support transparency sorting. With Ab3d.PowerToys library it is possible to perform simple transparency sorting and sorting by camera distance. 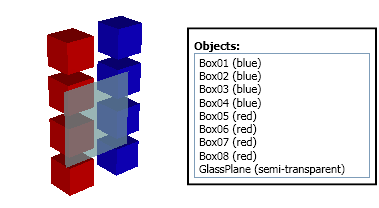 TransparencySorter class can be used to perform simple transparency sorting or ByCameraDistance transparency sorting where the transparent objects are sorted by their distance to the camera. When sorting by camera distance is used, the TransparencySorter can also automatically re-sort the objects when the camera is changed. To optimize the sorting it is possible to specify an angle that will tell how much the camera's direction must be changed when a new sort is preformed. Ab3d.Reader3ds went through a big test with our bigger customer. Many real world 3ds files were used to test the accuracy of the reader. Because many test files were not created with 3D Studio Max or similar product, many of them were not correctly formatted (it was not possible to open them with 3D Studio Max). After some changes in Ab3d.Reader3ds mst of those "broken" 3ds file can now be read correctly. This made the library even better and proved its status as the best library for importing 3ds files. The last relase of Ab2d.ReaderSvg, Ab2d.ReaderWmf and ZoomPanel library already got improved commercial licensing code. The change fixed a potential issue with using RSACryptoServiceProvider that can lead to very long delays when checking the license key. This issue has been now fixed for Ab3d.Reader3ds and Ab3d.PowerToys. Because of this issue it is highly recommended to upgrade to the new version. Additionally as with the 2D libraries it is now possible to set the EmbeddedLicenseAssembly property to speed up finding the embedded license key in the application. To see more details about this change please see the blog post for the 2D libraries or check the new help files. A very useful new features of the Ab3d.PowerToys library simplifies creating animated camera rotations. Before animated camera rotations were created with binding a DoubleAnimation to Heading property of the camera. But using DoubleAnimation has its drawback because it the animation locks the value of the Heading and therefore makes rotating the camera with the mouse impossible. The new version now include the StartRotation and StopRotation methods that can be used to simply start the camera animation. The StartRotation method takes two parameters: the first is heading change per second, the second is attitude change per second. The best thing about this is that while the camera is animated with StartRotation method, user can still use the mouse to rotate the camera (during mouse rotation the animation is suspended). This way it is very easy to create great presentations of 3D models where the model is rotated and the used can still manually change the rotation with the mouse. One of the very requested feature was also a support for OrthographicCamera. It is mostly used in technical applications where the ratios and parallel lines of the 3D objects need to be preserved. The OrthographicCamera is now also supported. A very nice new feature is also that axis names are shown on the CameraAxisPanel (it shows the orientation of axis of the current scene). A lot of work was also done to improve 3D lines. Now wireframes from existing 3D objects are created much faster and also use much less memory. Also the memory management of the 3D lines is greatly improved and enables user to have more control of the registered 3D lines. With new features the development of applications with 3D content has become even easier. WPF 3D is very capable of displaying 3D content for most needs of business applications. It also has many advantages over other platforms (DirectX, XNA). With WPF 3D, Ab3d.PowerToys and Ab3d.Reader3ds programming with 3D was never easier. I would like to conclude with saying that in my opinion desktop applications will not just sink into oblivion. They will still have their big share with complex business applications that need to be very user friendly, need advanced user interfaces to simplify complex user processes or require lots of resources. Despite many (usually not developers but marketing driven) considerations, I believe that WPF is still the very best technology for writing such applications.